The Coastal Sami of Varanger fjord in north Norway are today largely assimilated into the modern society and economy of Norway. They are farmers, com­mercial fishermen, and reindeer herders rather than hunters and gatherers. In the past, however, this large, treeless Arctic fjord, with its hinterland of stunted birch forests and mountain tundra, was the site of one of Europe’s last hunter-gatherer societies. Their seasonal pattern of resource use has been reconstructed by the archaeologist Knut Odner (Fig. 3). Higher levels of risk are typical of more seasonally fluctuating environments, especially where winter conditions of darkness and extreme cold make hunting difficult and the option of constant mobility becomes extremely arduous. Midwinter sedentism is virtually obligatory in sub-Arctic and Arctic environ­ments, where food storage is not so technically difficult (stored food will not spoil in the freezing conditions), but where substantial quantities of food energy must be amassed if the group’s winter survival is to be safeguarded. HG societies in such environ­ments typically invest much energy in strategies that enable them to cope with extreme seasonality—in particular, mass harvesting and mass storage. For HG groups, any risk of subsistence crisis will be reduced where (1) food energy derives from a diverse set plant and animals and (2) aggregate food resources are continuously available during the year, even if certain foods are more abundant in certain seasons. If a preferred food such as meat is temporarily scarce, then, through more intensive efforts and high spatial mobility, other less desirable foods (e. g., edible plants) can usually be accessed elsewhere. As a result of these strategies, basic supplies of food energy can be secured throughout the year, and what is produced is almost immediately shared and consumed. The Dobe subgroup of the! Kung San were studied by Richard Lee in the 1960s, and provide an example of these interacting constraints. For the Dobe, water is the overriding factor that dictates the location of camps. The camp serves as the home base for 30-40 people, who move out each morning in groups of 2 or 3 to collect plant foods (especially mongongo nuts) or hunt game. All groups must return before evening if they wish to share the common meal. After moving to a new camp, the food resources of the local area (defined by the Dobe as the area within a 2-hour hike) are exploited first. By fanning out in all directions and moving at about 5 km/hour with pauses for rest and work, an area within a 10-km radius can be worked in the space of a 6-hour day. 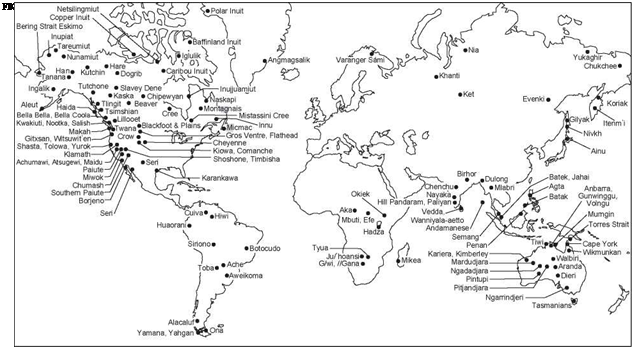 Hot deserts and tropical savannas (19 societies). • Tropical rain forests and coral reefs (30 societies). • Boreal forest and tundra zone (38 societies). • Cool temperate maritime regions (13 societies). • Other environments (15 societies). 1.2 Can We Extrapolate from HG Societies to Hominids?